My boys are bald. 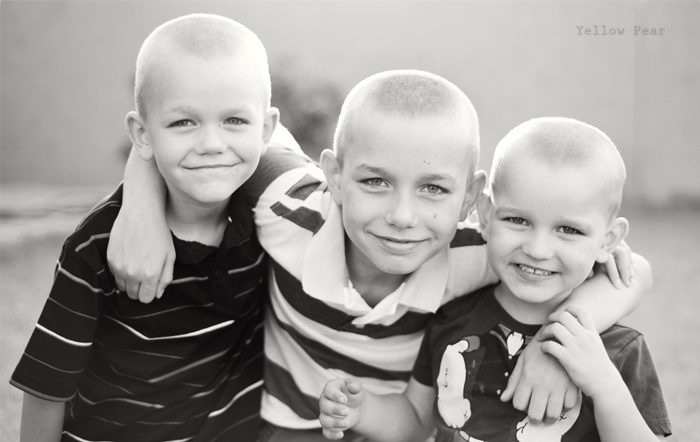 They shaved their heads in support of my sweet 10-year old nephew who in undergoing chemotherapy at the moment. He was diagnosed with Hodgkin's Lymphoma and even though it is quite treatable, he still has to endure the chemo, loss of hair, sickness and hospital stays (which he hates). Also his beautiful auburn hair may not grow back the same color. We have all worried for him and prayed and drawn pictures and sent well wishes and packages, but have felt a little helpless as to what more we could do. Mr. C decided to shave his head for his cousin because we live far away and it's something he can do from here to show support and love. At first we were just going to shave Mr. C's head. Dennis was extremely concerned about losing his luscious locks. He was really afraid people would make fun of him. So we told him it was totally his decision and that he didn't have to do it. One night after dinner, dad got out the clippers and gave Mr. C a temporary mohawk before shaving it all off. We giggled and laughed as he was transformed. Q couldn't let Mr. C have all the fun, so he hopped into the seat begging for a shave. After Q's hair was gone and there was even more laughing and more fun, Dennis couldn't stand it and decided he would join his brothers in baldness (per his request, we first discussed what to say if people teased). It was a good experience and Dennis has not (so far) been made fun of. I didn't realize he was so attached to his hair. Q has asked me repeatedly if I still love him without hair (which of course I do) and mumbles to himself that it will grow back. Funny boys. Also Q has a very square head. Which is accentuated times 100 without hair. Whoa. I guess Mr. C does too. Heads are funny things. On the upside, I don't have to do their hair and it must be much cooler in this 110-115* weather we've been having. Ugh. I can't wait for November when it finally cools off. I hate living in an oven. That is awesome your boys did that! What about Brynna?? :) I told her at piano that she should shave her head but she didn't go for it. And I love the picture, such a good one of your cute bald boys!! Thought about doing that, but didn't because of yearbook pictures. They look cute.